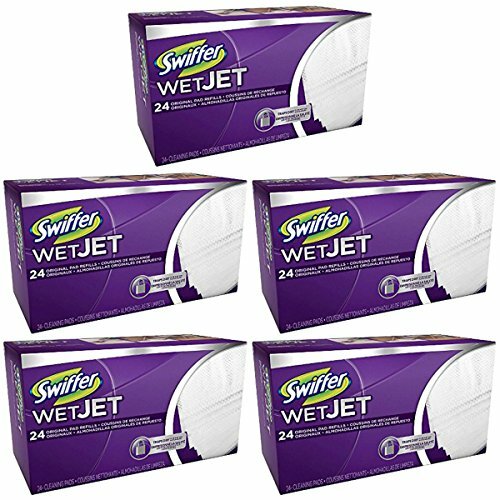 Swiffer WetJet Hardwood Floor, Wet Jet Spray Mop Pad Refills, Original Scent Refill Cloth, 5 Pack (24 Count) by Swiffer at Blog Free Here. MPN: Swiffer-80208260-5PK. Hurry! Limited time offer. Offer valid only while supplies last. Swiffer WetJet Multi-Surface mopping pads have a new ABSORB + LOCK STRIP that helps trap dirt & grime deep in pad so it doesn't get pushed around. Swiffer WetJet Multi-Surface mopping pads have a new ABSORB + LOCK STRIP that helps trap dirt & grime deep in pad so it doesn't get pushed around. When you're done, just remove the pad and throw it, and all that dirt, away forever. For best end results on your hardwood floor, use with Swiffer WetJet solutions. There's a perfect solution for any cleaning need. Recommended WetJet mopping pad for use on finished wood floors do not use on unfinished, oiled or waxed wooden boards, non-sealed tiles or carpeted floors because they may be water sensitive. Safe on all finished floors do not use on unfinished, oiled or waxed wooden boards, non-sealed tiles or carpeted floors because they may be water sensitive.